As the application of blockchain technologies builds momentum across the oil and gas industry, digital infrastructure innovations are extending towards the evolution of Smart Contracts. As oil and gas companies look for more accurate, cost-effective and faster transaction processes with less contract disputes and minimal human intervention, there is a clear paradigm shift towards the decentralized cloud. In summary, smart contracts are an obvious next step in the evolution of blockchain technologies for the oil and gas sector. As multiple assets pass down a complex chain before reaching their final destination, the ability to seamlessly track these exchanges and ensure automated payment release is paramount. The Era of Smart Contracts Is Upon Us. 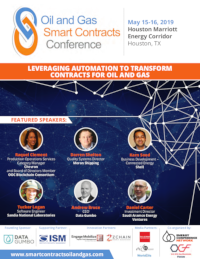 The Oil & Gas Smart Contracts Conference 2019 will discuss the impact of transformational technologies on the sector. Through first hand presentations and interactive discussions, attendees will have the opportunity to deep dive into the opportunities and prepare for the challenges associated with Smart Contracts. Blockchain is here. Stay on top of it!